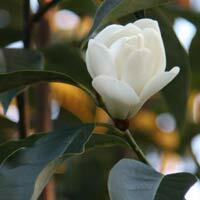 A group of versatile, easy to prune trees and shrubs, Michelia are now known as Magnolias. Michelia are a group of evergreen trees from China, through to Vietnam, The Philippines and India. Linnaeus named them after the Italian botanist, Pietro Antonio Micheli. They have always been seen as closely related to magnolias and in fact Michalias have recently been renamed as Magnolias. So what was M. yunnanensis is now Magnolia laevifolia, the popular Michelia figo is now renamed Magnolia figo. In most cases Michelia is the commonly used name although with new releases it is tending to change to what is regarded as ‘correct’. Being easy to prune, fast growing and tolerant of a range of spoil conditions these are a widely used landscaping plant.